Governments are increasingly recognizing Indigenous Peoples’ and local communities’ rights to land and resources. Despite increased recognition, there are several shortcomings in the legal frameworks through which governments formally recognize community-based property rights. Building on consultations with legal experts on community rights, recent literature, and a review of over 200 national legal instruments, this paper proposes a framework of analysis to systematically classify and evaluate legal pathways to secure recognition of community-based property rights. The framework considers five key elements common to laws recognizing community-based rights, and helps determine how these rights can be exercised and implemented in practice as well as three common legislative entry points through which legal recognition can take place. 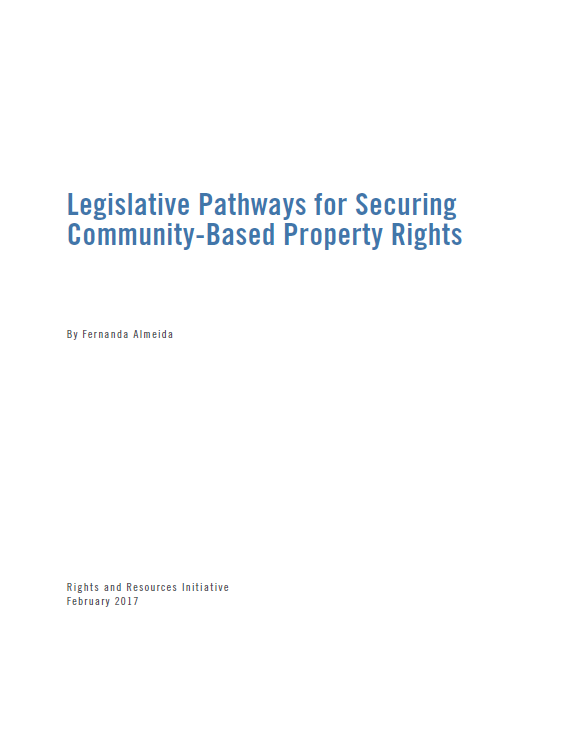 Furthermore, to illustrate the variety of legal pathways (and potential advantages and limitations of each) that have been used by national legislators to recognize community tenure rights, the paper also applies this framework to the legal frameworks (or tenure “regimes”) included in the Rights and Resources Initiative’s legal tenure rights database. It concludes that although legal recognition in national systems has advanced in the past decades, it is far from ideal, even in the best cases.